The theory behind it is that they can etch grating patterns inside a piece of fibre, both glass and polymer, and when you shine light down the cable, the grating patterns will reflect specific colours of light depending on the spacing of the grating, the clever part is, that if the fibre is distorted the spacing of the grating changes and the colour of the light that is reflected changes as well. You can add different gratings in different positions down the length of the cable and so get multiple sensors in 1 fibre optic. Given that the core of a fibre is 8 µm in diameter, you need some serious kit to create the gratings, but I believe there are commercial suppliers. 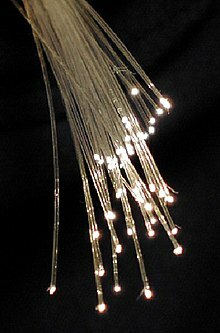 I’m not sure if I will investigate this technique directly, as I have also started thinking about using fibres ‘coupled’ to a ccd of a camera and seeing if I can detect light intensity changes down the length of the fibre, this might make it possible to make a interactive 70’s lamp out of a bundle of fibres for example, or something, more convoluted of course!